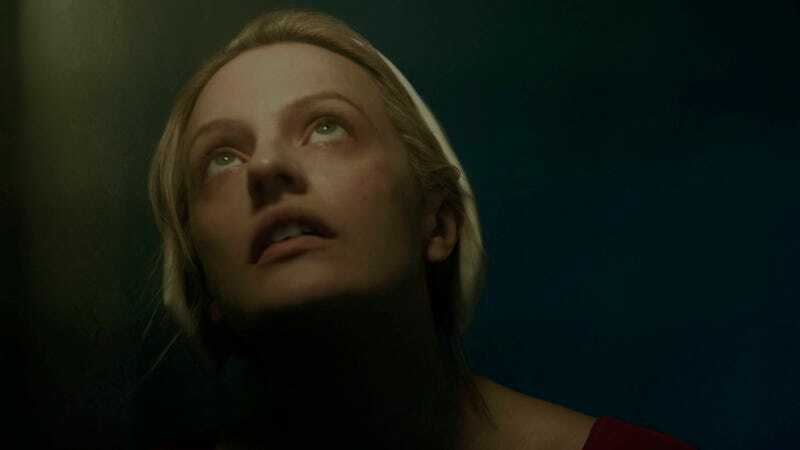 Even though there were some significant changes and additions, the first season of The Handmaid’s Tale followed the basic structure of Margaret Atwood’s classic novel, all the way through the end of Offred’s journey. That means next season will, for better or worse, show us a new chance to explore Gilead—and the world it inhabits. So here’s what we’d like season two to tell us about it. The Handmaid’s Tale has already been renewed for season two, and plans are in motion for Hulu’s second visit to Gilead. In an interview with The Hollywood Reporter, showrunner Bruce Miller said he’s working with The Handmaid’s Tale author Margaret Atwood to come up with stories and plotlines that fit with her overall vision. However, this isn’t going to be easy; the show’s already taken some pretty stark departures from the book—like Luke being alive (and getting his own episode), or Offred finding out she’s pregnant at the end of the season. It’s going to be interesting to see how these two visions combine (or collide) as the show officially moves past the non-symposium ending of the book and into uncharted territory. There are a few things from the book that haven’t been addressed yet that we’d love to see covered on the show, as well as some new elements that would expand our understand of Gilead and its place in the world. 1) How exactly did people get infertile? Gilead’s rise is a result of fear, panic, and opportunism over the infertility crisis. So far, we’ve learned it impacts the United States and Mexico, but haven’t heard if it’s an international crisis or something limited to continental North America. This raises the question of what prompted the crisis in the first place, and how bad the problem really is. In the book, the infertility crisis is reportedly caused by overuse of birth control and the rise in sexually transmitted diseases. The symposium epilogue states this too, although Gilead could’ve easily exaggerated the role to condemn women’s sexual liberation. There’s also the environmental issue, which is likewise touched upon in episode six, “A Woman’s Place.” This could mean pollution, climate change, or even a nuclear war. The point is no one’s really said why infertility is happening and how many people it affects. It’d be great to get a look at people who were in the midst of the crisis, to get a better semblance of what happened when. For example, a flashback to show what the government was (or was not) doing to address rising infertility— before Gilead rose to take over the United States. 2) What’s going on in the Colonies? The Colonies are basically the Krampus of Gilead, an ever-looming threat that targets misbehaving citizens in the religious country. If you get sent there, you’re basically doomed to die—at least, that’s what we’re led to believe. In the show, the Colonies are parts of North America that have been contaminated by pollution and radioactive waste. Gilead sends criminals, failed handmaids, and other Unpeople there to live out their lives as slaves, cleaning up toxic waste until they die. However, there are so many unanswered questions about the Colonies that need to be addressed: How big are the Colonies, and does Gilead control all of them? Are they as bad as people fear, or has Gilead created or exaggerated a myth to keep people in line? And, my biggest question... is that where Mayday is hiding out? It’d be the perfect cover, so long as they could protect themselves from pollution. 3) How did the war go? Out of all the problems I have with the show, and there are a few, the biggest one is the way it handles the timeline. There are several episodes that show how Gilead spread itself across the United States, gaining followers and preparing to take over the government, but there’s still no explanation of how the war happened and how the hell US citizens could’ve remained so ignorant of the group that took over their country. I feel like the best way to address that would be to have a flashback for Rita, the servant in the Waterford’s home. In episode nine, “The Bridge,” we learned that Rita’s son died in the war, though we still don’t know what side he was on. This is the gateway to learning more about the conflict. Focusing a storyline on Rita’s past would enable us to see how everything escalated and how the Sons of Jacob were able to prevail against a force as big as the US military. 4) What is Gilead doing with its children? Gilead’s most-prized possession is children, which is why they created the handmaid program in the first place. And yet, we don’t exactly know what the Republic is doing with them. In the show, we’ve seen the group of Gileadean children being paraded in front of the Mexican ambassador, as well as some girls at school. But we know little about how Gileadean children are being educated, how they’re handling being separated from their parents, and what purpose the Republic wants them to serve in the future. Since Hannah’s location has been revealed, fixing the spotlight on her for a bit would give us a better insight in how children are being treated in Gilead (hopefully with an older actress, to better match the timeline). Are boys being conscripted into the Sons of Jacob? Are girls trained as future handmaids, even if their fertility can’t be tested? Plus, which kids remember their parents, and what do they think of them now? Since the children are the future, it’d be smart to show what exactly that future entails. 5) How does the world view Gilead? Gilead might isolate itself from the rest of the world, but you can damn well bet the rest of the world isn’t isolating itself from Gilead. As we learned in the season finale, “Night,” several countries are working with Canada to house refugees from the Republic. It doesn’t look like Gilead has a lot of friends. In the show, their only known trading partner is Mexico—and in the book, the country hosts Japanese tourists. Now that Moira has joined Luke in Canada (and Miller said the show will partially take place there), it makes sense to expand the scope and give us an idea of what the world thinks of Gilead. Perhaps have Moira serve as a witness at the United Nations, to tell international leaders how women in Gilead are being kept as sexual slaves. This would also give us a better glance at how widespread the infertility crisis is. And if it’s a localized problem in North America, whether other nations are bothering to do anything about it. 6) What the hell is Aunt Lydia’s deal? I previously argued that Aunt Lydia is The Handmaid’s Tale’s best example of a true believer–and by the end of the season, I think that’s a stone-cold fact. She’s completely devoted to Gilead’s mission, and sees it as the right path for her and the rest of the country. While her dedication to her handmaids, like when she cried as Janine was about to be stoned to death, suggested she may be conflicted about Gilead’s path... that couldn’t be more wrong. Her love for her handmaids wasn’t in spite of what Gilead is doing... it’s because of what Gilead is doing. I would love nothing more than to see Aunt Lydia’s backstory next season. When did she join the Gileadean cause, and how exactly did that come about? I can’t believe she was forced into that life, given her dedication to the cause. “A Woman’s Place” did an excellent job of showing female complacency in Gilead’s patriarchal society—a history lesson about the Aunts, centered around Lydia’s journey, would enhance that. 7) Is a civil war on the way? The symposium epilogue at the end of The Handmaid’s Tale indicates that there was a lot of internal strife in Gilead up until its fall. Commanders in different periods of Gilead’s rule behaved differently based on how stringent the rules were for them. There doesn’t seem to have been an outright civil war, but there were internal conflicts that sowed discontent. This is something we’re seeing echoed in the character of Andrew Pryce, an Eye who’s determined to “clean up” Gilead of its corruption. It seems like he’s going to play a bigger role next season, as the upstanding moral compass of Gilead who refuses to bend or break for the other commanders. Given Pryce’s role in the Sons of Jacob, and his clearly obvious issues with Gileadean leadership, it seems possible that discontent could turn into something bigger. I’d personally love to see a sort-of civil war brew inside Gilead between rising factions, echoing how Protestantism splintered into thousands of denominations in the centuries following the Reformation. 8) Where is Offred’s mother? Offred’s mother is a key figure in the book, demonstrating the ideological clash between second-wave and third-wave feminism (though it’s been argued we’re in or nearing the fourth wave nowadays). In the book, Offred learns from Moira that her mother was sent to the Colonies, implying that she died from forced servitude in the toxic environment. However, there’s been no mention of Offred’s mother on the show so far, leaving the door wide open for her arrival and impact on the story. Personally, I’d love to see Offred’s mother as a key figure in Mayday, who had Offred rescued after learning her location (since she helped Mayday recover a package in “The Bridge”). This risks venturing into “How convenient!” territory, but it would also give the show a chance to demonstrate the inner complexities within feminism as a movement... contrasting with Gilead’s own turmoil through conflicting religious ideologies.